While generally benign, occasional aggressive histologic features in the melanotic neuroectodermal tumor of infancy (MNTI) have been used to justify a diagnosis of malignancy; this could lead to overtreatment. We report a case with presumed aggressive histologic features that did not recur following conservative treatment. This adds evidence that histologic features are not predictive of clinical behavior in MNTI. Melanotic neuroectodermal tumor of infancy (MNTI) is a rare, locally aggressive neoplasm occurring most often in the anterior maxilla of infants <1 year of age. Despite rapid growth, MNTI is generally considered benign as it responds well to local surgical excision. Aggressive histologic features have led to upgrading to malignancy, a decision which could lead to unnecessary wider surgical excision. We report a case with presumed aggressive histologic features that did not recur following conservative treatment. This adds evidence that histologic features are not predictive of clinical behavior in MNTI. A healthy, 4-month-old female patient presented with a rapidly enlarging, smooth, pink to slightly bluish, expansile mass of the right anterior maxilla [Figure 1]a. Computed tomography scan showed facial displacement of the right, primary, maxillary central incisor by an expansile, bilobed, unilocular radiolucency which caused erosion of the buccal and palatal cortices [Figure 1]b. Following an incisional biopsy confirming the diagnosis of MNTI, surgical resection and peripheral ostectomy were performed. At 1 year follow-up, there was no evidence of recurrence. Histologic sections showed a soft-tissue mass consisting of a biphasic tumor cell population [Figure 1]c, consisting of variably sized islands of neuroblastic and epithelioid cells set within a fibrous connective tissue stroma. The neuroblastic cells showed modest variation in nuclear size and shape with speckled chromatin and minimal cytoplasm. Strands and clusters of larger epithelioid cells occasionally contained finely brown cytoplasmic pigment, compatible with melanin. Mitotic activity within most of the neuroblastic cells [Figure 1]d ranged from 2–10/10 high-power fields (HPFs). There were focal areas of necrosis within this cell population [Figure 1]e where up to 18 mitoses/10 HPFs were seen. Lateral and deep/peripheral margins were transected microscopically, although ostectomy may have eliminated the residual tumor. Immunohistochemically, the epitheloid cells were positive for pancytokeratin and HMB-45, while the neuroblastic population was positive for synaptophysin. Neuron-specific enolase stained the neuroblastic cells most intensely with some reactivity within the epithelioid component. Antibodies directed against CD99 yielded prominent membranous staining within the epithelioid cells but was generally negative within the neuroblastic cells [Figure 2]a, and approximately 27% of the cells were positive for Ki-67 [Figure 2]b. Conservative surgical excision is generally recommended for MNTI, although there is currently no evidence to suggest proper margin size. This is in part due to rapid growth and potential invasion of adjacent structures, which likely leads to the reported 5-year recurrence rates of 22%–25%. Prediction of recurrence and accurate classification of the rare malignant MNTI with true metastatic potential requires improved diagnostic markers. Attempts to predict biologic behavior through histologic indicators has been problematic. A case series of MNTI  reported that one of eight cases had an increased mitotic rate (seven out of ten HPFs), an increased Ki-67 positive fraction (>25%) and CD99 expression. This case recurred within 1 month following local excision, with rapid involvement of the entire upper jaw, requiring bilateral maxillectomy. The other seven cases lacked these microscopic changes and did not recur following local excision, suggesting these features could be predictive of aggressive biologic behavior. 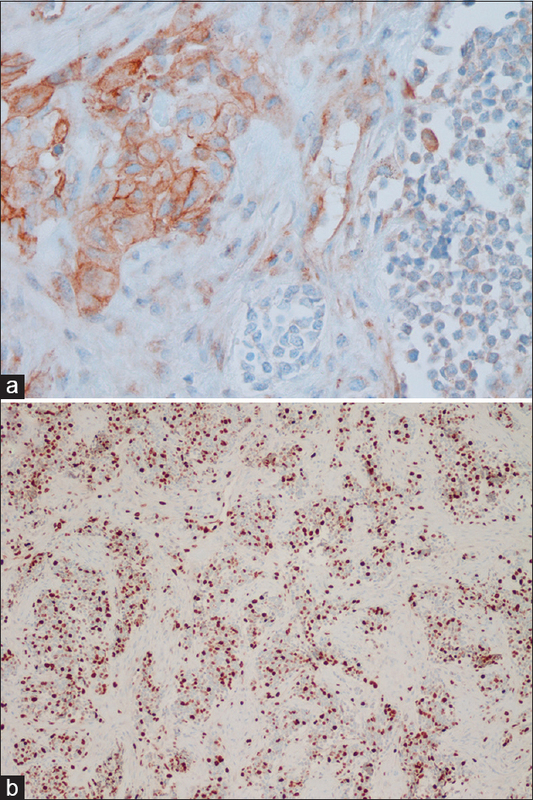 This report influenced another group to classify a case as malignant based on the presence of mitoses (up to one/HPF), CD99 reactivity and a 40% Ki-67 fraction; even though, there was no recurrence and the patient was disease-free at 1 year. While our case also showed an elevated mitotic rate, increased Ki-67 expression and CD99 reactivity, the tumor did not recur. This is similar to a report of a maxillary lesion in a 6 week old which showed increased mitotic figures (5–10/10 HPF), a Ki-67 fraction >30% in the neuroblastic cells and CD99 reactivity in the epithelioid cells, but likewise did not exhibit tumor recurrence at 18 months postsurgical excision. Although still limited, these findings indicate that Ki-67, CD99 expression and increased mitotic activity do not predict biologic behavior in MNTI and therefore should not be used to justify a diagnosis of malignancy. Necrosis is rarely reported in MNTI but was noted in a 13-year-old with a calvarial lesion showing widespread intra-cranial metastases. Only “occasional” mitotic figures were noted in this case report, and immunohistochemical studies were not performed. To the best of our knowledge, our case is the first to report necrosis in MNTI affecting the anterior maxilla. Importantly, this feature did not signify aggressive biologic behavior. Thus, mitotic activity, Ki-67 and/or CD99 expression and necrosis are not histologic predictors of aggressive clinical behavior in MNTI. The only current predictor of recurrence and disease-free survival is the age at diagnosis. Patient age <2 months at diagnosis portends the worst prognosis with sequential improvement over time; after four and one-half months of life, there is minimal chance for recurrence. As recurrences have occurred within 6 months of initial treatment, close follow-up immediately following surgery is critical to detect an aggressive clinical course. The authors would like to thank Spencer Shumway for graphics editing. Rachidi S, Sood AJ, Patel KG, Nguyen SA, Hamilton H, Neville BW, et al. Melanotic neuroectodermal tumor of infancy: A Systematic review. J Oral Maxillofac Surg 2015;73:1946-56. Barrett AW, Morgan M, Ramsay AD, Farthing PM, Newman L, Speight PM, et al. Aclinicopathologic and immunohistochemical analysis of melanotic neuroectodermal tumor of infancy. Oral Surg Oral Med Oral Pathol Oral Radiol Endod 2002;93:688-98. Krishnamurthy A, Vaidhyanathan A, Majhi U. Malignant melanotic neuroectodermal tumor of infancy arising in the mandible. J Cancer Res Ther 2011;7:368-72. Manojlović S, Virag M, Lukšić I, Müller D. Melanotic neuroectodermal tumour of infancy: Report of two cases and review of the literature. J Craniomaxillofac Surg 2012;40:e103-7. Furtado SV, Ghosal N, Hegde AS. Calvarial malignant melanotic neuroectodermal tumour of infancy presenting with widespread intracranial metastasis. J Craniomaxillofac Surg 2012;40:e170-3.